In our previous blog, we covered the main challenges of new customer onboarding. Now, we have collected a list of best practices from industry leaders such as Airbnb, Intercom, HubSpot, Apple Music, Instagram, and Slack. It’s important to look at these tech giants for know-how, because they have a track record of innovating in user experience during the onboarding process. In addition, their products have already completed the adoption cycle, which provides strong evidence of the effectiveness of their practices. These practices, coincidentally, relate to the main challenges of capturing the attention of a new user, as outlined in our previous article – complexity, information overload and continuous access to relevant support. The goal of onboarding is not retention, repeat purchases or Net Promoter Score. The goal is to help users understand and appreciate your product or service, to the point where they are willing to contribute to the above metrics. Tailoring the experience of new users solely towards hitting an internal KPI of some percentage of actions or features used is one of the most commonly encountered missteps in onboarding. According to Intercom, rather than relying solely on emergent metrics and then forcing users to hit some business targets, modern onboarding focuses on the user and what they want to achieve. This methodology consists of continually asking newly signed-up customers what they are hoping to achieve with your product, learning what their individual goals are, and ensuring each one of them believes they are on a path to success. 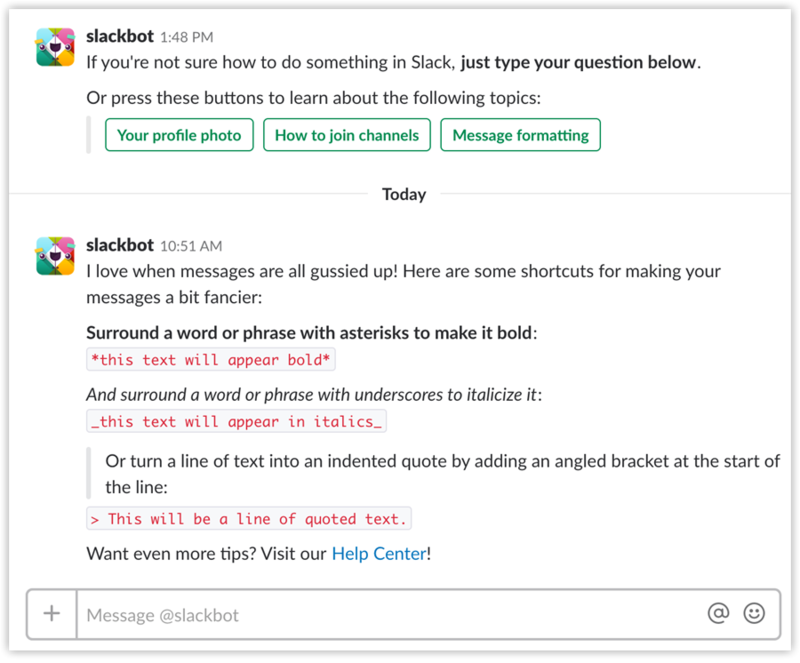 A success case in practicing this is Slack, whose onboarding experience consists of a series of questions posed in text message form by their chatbot. The chatbot helps new users set up their account, while at the same time teaching them about how to use the product itself. Slack then uses the results of this questionnaire to better understand its users’ goals and continuously optimize the onboarding experience. The Slackbot walking users through the onboarding flow. Image: Slack. Getting to know more about your customers and their individual goals also helps create a good idea of the amount of onboarding they need. Surveys, or alternatively the analysis of usage data, can help you paint a very clear picture of whether your customer needs (or even wants) to know everything about your product. Separating between power-users and regular new signups is key to tailoring a well-fitting onboarding journey. To avoid the information overload, as described in our previous post, many companies implement modular, highly personalized onboarding flows. The content and speed of delivery of information is determined by a customer’s interactions, even before they became a customer. A history of browsing the webpages that explain in detail the technical specifications of your product indicates a very different type of customer from those who engaged with your blog and social channels. This practice, known as segmentation in the web analytics world, is a powerful tool in tailoring the onboarding experience, according to Leanplum. Even more important, the first interactions with the onboarding flow itself should determine how it goes forward. According to HubSpot, your product’s success depends on users establishing comfort with core features. Not all features however; only the ones fundamental to the value of the product. Once that foundation is built, every customer persona can be given a different onboarding experience that best reflects what they intend to use the product for, and how much. 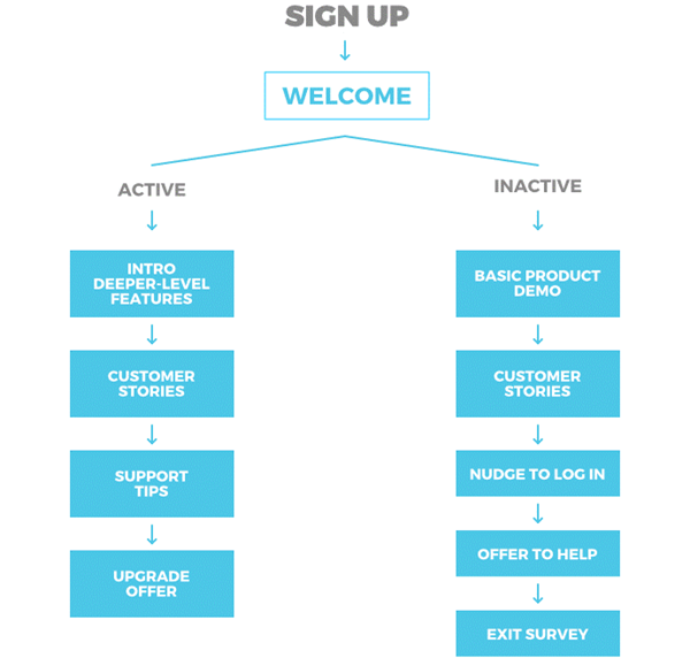 A flowchart demonstrating the different onboarding flows for different user types. Image: GrooveHQ. For many of the not-so-savvy customers, the onboarding flow can continue well into their user lifetime. When done well, small educational bits of information can proactively resolve potential issues or questions. This blurs the lines between what onboarding is and what proactive customer service is even further. An example of great proactive customer service that uses onboarding techniques is Airbnb’s booking abandonment notification flow. The first time a user has begun booking a listing and dropped out, Airbnb sends a notification, both on mobile and via email, helping the user complete the process. Practicing this method well requires a very strong understanding of user behavior – why was the purchase abandoned, in this case – in order not to create a feeling of intrusion. 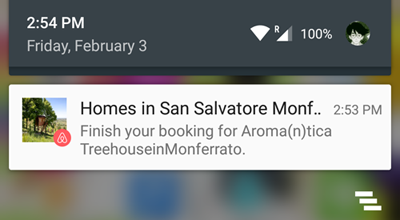 Airbnb’s notification to complete an abandoned booking flow. Image: Leanplum. On the other hand, when done well it manages to deliver the most value – create a savvy user, provide proactive assistance when it was needed the most, and complete the commercial objective of the product.